On June 23, Team VOKRA will be participating in the Scotiabank Half-Marathon and 5k run/walk and we want you to join us. It might not change your life, but your support will definitely help change the lives of the more than 1,400 kitties we rescue each year. Kitties like Abu, a tiny orphaned kitten who arrived at VOKRA hungry and with a bad cold. He, along with his brother and sister, needed round-the-clock care and bottle feeding. 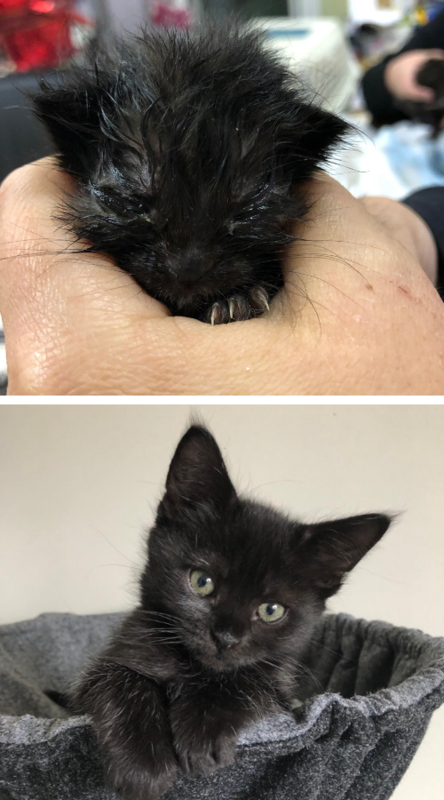 As the runt of the litter, we weren’t sure if Abu would make it, but with the care and attention of his foster mom he’s thriving today and has gone to his new home. Whether they’re kittens or adults, feral or tame, healthy or sick – VOKRA provides them all with the best care we can. But this does come at a cost. You don’t have to be an athlete to join. And few on our team have ever fundraised before either (you only need to commit to raising a minimum of $50). All you need is a love of cats. This love is what unites us as a team and carries us all over the finish line! Don’t forget to indicate you’re joining the VOKRA official charity team and add “Team VOKRA” as the name on your bib! Once you’re registered you’ll receive a link to your personal fundraising page so you can get started right away. And to help ensure you achieve your goal, Team VOKRA will provide you with a motivational emails to help you fundraise. We’ll also invite you to join the Team VOKRA Facebook group so you can connect with your fellow team members. So there’s no excuses! Sign up today and join Team VOKRA! Be sure to reserve your Team VOKRA spot as soon as possible so you don’t miss out! Don’t want to run? You can still help when you sponsor Team VOKRA today!